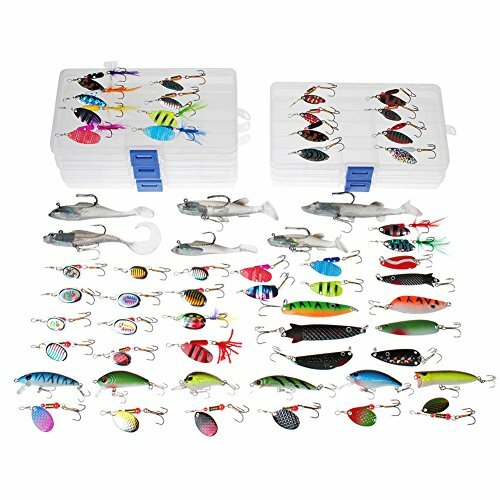 *Flexible compartment design with movable slipsHuge Kit including 5 Fishing Boxes containing totally 40pcs spinners, 8pcs spoons, 6pcs Soft Lures, 5pcs Crankbaits & 1pcs Popper. All very good quality and effective. There are different types of spinner patterns including 8pcs of American Bucktail style. Soft plastic swimbait are black back with flash foil and pre-rigged with quality trebles, which have been proved as crazy catcher for big pike. The wonderful joblot covers various species and condition. Great for Trout, Perch, Pike and Smaller Salmon. You can cast it in river, lake and the sea(near-shore, bank). Whether you fish them near your home, or going on a further trip within Britain, even to French, they just get the job done. Spinners weighted range from 2g to 4.5g including hooks.